Heat oven to 350° F. Grease 24 mini muffin cups. In large bowl, beat 1/3 cup butter, 1/2 cup sugar and the egg with electric mixer on medium speed until blended. In medium bowl, mix flour, baking powder, salt, nutmeg and ginger. Add alternately with milk to butter mixture. Divide batter evenly among muffin cups. Bake 15 to 18 minutes or until light golden brown. Cool 5 minutes. Remove from pan. In large food-storage plastic bag, mix 1 cup sugar, the cinnamon, garam masala and cardamom. Roll hot muffins in melted butter, then toss in sugar mixture to coat. Serve warm. Developing recipes can be challenging. Usually it takes hours of concepting and several kitchen tests to get it just right. 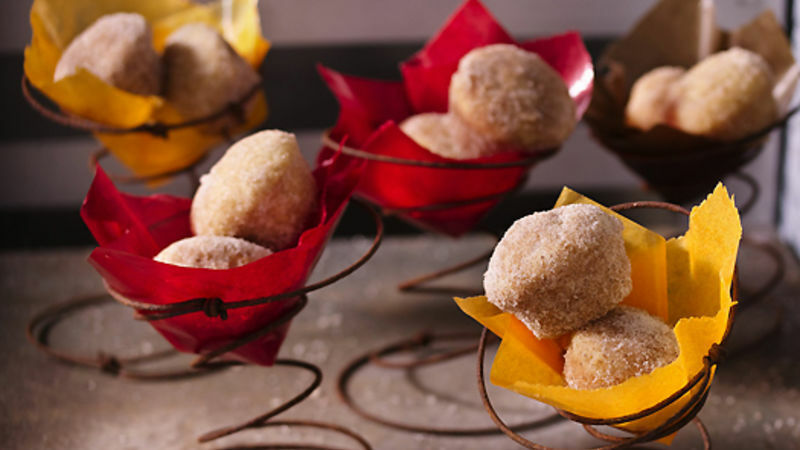 Sometimes it’s a piece of cake -- like when we created this recipe for Indian Spiced Mini Donut Muffins. Sure, it helped that the recipe idea was actually created years ago. You see, just like people, recipes can benefit from a makeover. To create our Indian Spiced Mini Donut Muffins, we performed a muffin makeover. Here’s the story. As Betty Crocker Taste Seekers, we’re constantly trying new foods, reading new recipes and generally searching and hunting all over for food trends and recipe ideas. Sometimes an idea just hits us -- THIS IS IT! That’s what happened with the idea for donut muffins. What’s a donut muffin? It’s a simple spiced muffin that’s been dipped in melted butter and rolled in cinnamon sugar. It’s a muffin that tastes like a donut. You (or your Grandma) may also know them as French Breakfast Puffs. Do you like to go sweet or savory for breakfast?